Here in Tenerife there are a vast array of amazing things to see, do and experience that will surprise and delight you during your stay here at Pearly Grey. What you will discover is that the island has so much more to offer than simply sun, sand and sea. While there are many undeniably beautiful beaches to enjoy and of course the wonderful resort swimming pool and other fantastic onsite amenities, we also fully encourage you to experience some of the other amazing features that the island has to offer. We want to fully dispel the tired image of Tenerife as somewhere to come and laze on the beach or by the pool for a week and what better way to do that than recommending some brilliant excursions for you to try! Due to the wonderful year-round warm, sunny climate in Tenerife it is the perfect place for outdoor activities. One fantastic option is an exclusive Pearly Grey kayaking and snorkeling trip so you can enjoy getting out on the ocean waves. This excursion runs on either Monday or Thursday morning and you will be collected from outside reception and transported directly to Palm Mar coast to begin. The kayaking lasts about one hour and a half and is huge fun for all the family, with regular sightings of dolphins during your time on the ocean. Afterwards, as you back along the coastline towards the beach you will have the opportunity to swim and snorkel where you will catch glimpses of fish, sea turtles and other amazing marine wildlife. Once you are back you will be able to enjoy a snack and refreshments at the beach bar, before being taken back to Pearly Grey for 2pm. 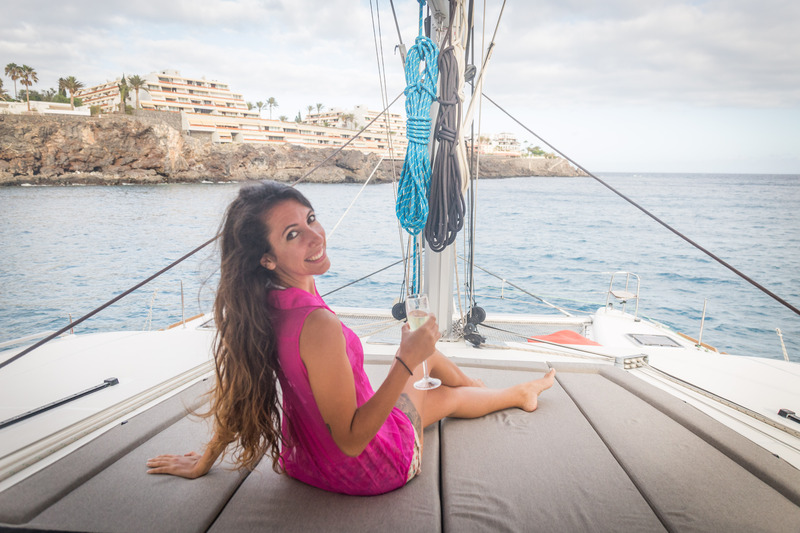 There are few experiences more satisfying or luxurious, then a private sailing yacht trip on the beautiful Atlantic Ocean waters along the coast of Tenerife. One superb option is a trip with Blue Jack Sail on their fantastic luxury yacht. During an excursion with them you will sail out from Puerto Colon in Costa Adeje and be taken on an amazing trip that lasts around three hours. This is an absolutely wonderful experience being out on the ocean waves, with the wind in your hair, sunlight beaming down and stunning views of Tenerife. During this time you are almost guaranteed to see dolphins or whales and very often both, as the waters around the Canary Islands, including between Tenerife and La Gomera are some of the best in the world to see these wonderful creatures in the wild. Seeing them in the ocean is a truly magical experience! During the excursion you will be provided with soft drinks, wine and beer, plus lunch including sandwiches and fresh fruit and there will be an opportunity to swim and snorkel next to the lovely little village of El Puertito, before sailing back. If you are looking for something awesome to do in Tenerife that all of the family will enjoy, then you definitely can’t miss a trip to Siam Park which has once again retained its coveted crown as the Best Water Park in the World (Tripadvisor 2018 Travelers’ Choice)! Siam Park has a gorgeous exotic Thai themed setting which is picture perfect under the beautiful sunny, blue sky of Tenerife. This is contrasted with an incredible array of fantastic rides and other features, including the famous Tower of Power free-fall slide (not for the faint-hearted) and many other adrenaline fuelled slides that all tremendous fun, plus a huge lazy river, a massive beach area with sunbeds and a giant wave pool, activities for smaller children, places to eat and drink and more. Whether you are looking for a relaxing day out or adrenaline fuelled fun, Siam Park really is the place to go! Not only does Tenerife boast the Best Water Park in the World, but it also has the Best Zoo (Tripadvisor 2018 Travelers’ Choice), the world famous Loro Parque! Here you will find a vast array of amazing animals in a spectacular setting. The zoo is based in the north of the island near the well-known town of Puerto de la Cruz. It has been designed with a similar exotic style to Siam Park, including a Thai village and treetop walk, making the park a really interesting place to explore. Of course, it is home to a whole host of amazing animals such as Sea Lions, Parrots, Pelicans, Gorillas, Chimps, Tigers, and even Sharks. Many of the animals are endangered so the park acts as a sanctuary to them. As well as these and many more, you will also be able to see the spectacular dolphin and orca shows. Not only will you find plenty of amazing attractions created by people, but you will be absolutely amazed by the stunning natural environment of the island. There are some truly incredible landscapes, one of the most amazing being the mountainous interior which is dominated by Mount Teide, a volcano which stands at 3,718-metres tall, making it the third highest point in Spain and highest point above sea level in the islands of the Atlantic. The height of the surrounding Teide National Park, means it has been crowned as a “Starlight Destination” due to the extremely low-level of light pollution which makes it one of the best places in the world for stargazing. During this unique and unforgettable tour, you will be transported from Pearly Grey to Teide National park where you first experience the sunset which are often truly spectacular. Then once darkness falls you will experience the breathtaking sight of a sea of stars above you! The professional guide will point out constellations and other features, answering any questions you may have. To top off this magical evening you will be served a delicious three-course meal in the highest restaurant in Tenerife! For something completely different, how about a trip to see the famous Music Hall Tavern (MHT) comedy drag show in Las Americas. As you can tell, in Tenerife you can experience a huge abundance of different excursions and entertainment ranging from world famous water parks, to top global stargazing sights, right through to an evening of hilarious drag show comedy. If you’re looking for an opportunity to let your hair down and have a really good laugh with your friends or family, then you can’t go wrong with the Music Hall Tavern. This is a show packed with non-stop laughter and surprises, just what you need to help forget the humdrum of daily life back home. The costumes are amazing and the performances excellent. There is a pick up from Pearly Grey in Callao Salvaje three days per week. While it is spectacular to witness some of the ocean life such as whales and dolphins from above the waves, it is from beneath the surface that you will truly be able to appreciate how abundant ocean life really is. Another of Tenerife’s unique experiences to try while you are staying at Pearly Grey is a trip with Submarine Safaris. This is a perfect trip for all the family and will especially delight younger children who will be amazed to see all of the fish and other sea creatures, such as the giant and graceful stingrays who are fed by some of the Submarine Safaris team who scuba dive alongside. The submarine descends to an impressive 27 metre depth, with the trip lasting around one hour, plenty of time to see an amazing variety of ocean animals! While some of the other excursions such as Sea Kayaking, Blue Jack Sail and Submarine Safaris offer relaxing ocean experiences, for something more exhilarating there is Jet Skiing with West Tenerife which offers a truly awesome time! From Los Gigantes harbour you will be taken along the coast by boat and then from there board the jet skis. These are safe, modern jet skis perfect for almost all ages. You will be able to speed along the coast towards Punta de Teno lighthouse taking in views of the incredible Los Gigantes cliffs which are some of the highest in Europe! Later on you will get an opportunity to swim and snorkel at a perfect spot, plus enjoy drinks and fresh fruit onboard the company boat. After you’ve checked out some of the fish and other marine life, you’ll get another chance to speed along on the jet-skis back to Los Gigantes harbour which is an absolutely exhilarating rush. For a completely different view of the island, with a real touch of luxury, what better option than a private helicopter flight with Helidreams! Tenerife is an incredible island however you choose to experience it, but for a truly memorable trip, a helicopter flight offers quite literally a completely different experience. A helicopter flight is one of those once in a lifetime kind of trips and seeing Tenerife from this incredible perspective is breathtaking. As you soar above the coast, towns and resorts and volcanic interior you can appreciate just how diverse and spectacular the island truly is. Speak to the team at Helidreams and they can custom design a trip for you, so you can experience the best views that Tenerife has to offer which includes (of course) Mount Teide, the wine growing region of La Oratava valley, Los Gigantes, Vilaflor, Puerto de la Cruz and much more. Just remember to bring your camera or phone, to get those perfect instagram shots! For a fantastic evening out, you should definitely book a ticket to the Showtime evening Cabaret. This is an excellent, family-friendly choice that everyone will love, with brilliant performances from all of the cast. The show includes live-singing, dance, magic and illusions, and some hilarious comedy. The show is very close by to Pearly Grey and many of the cast feel like family as some of them even used to work at the resort. You can book tickets to the show which includes dinner and drinks from Pearly Grey reception team and transport to and from the resort is also included in the price. Get ready for a spectacular evening full of fun and laughter! As mentioned earlier, the ocean waters around the Canary Islands are some of the best in the world to witness whales and dolphins, so while staying here at Pearly Grey it is a great opportunity to take a trip out on the ocean to witness these animals in the wild. A brilliant option that is perfect for all the family is aboard the Freebird Catamaran which leaves from Puerto Colon in Costa Adeje. On board you will provided with lunch as part of the trip, along with complimentary drinks including beer and soft drinks. During the trip the catamaran will stop to give you a chance to swim and dive off the back which is really refreshing after sailing around under the sunny Tenerife skies. Another family friendly favourite is Jungle Park which offers fun for all ages. Conveniently situated just 15 minutes away from Los Cristianos, it is very easy to reach. The park has a wide variety of amazing birds and animals and is famed for the spectacular shows. It also offers fantastic value for money. You’ll be able to see incredible condors and eagles in free flight above the park, as part of the daily shows which is really an awesome sight to watch. The grace, power and speed of these birds is absolutely amazing. The park is very well designed and offers a sense of exploring a jungle. There is plenty to keep you entertained, including an exhilarating bobsled ride! This is a perfect choice for a fun-filled day out with all the family. There are a variety of different slides, some of which have been specifically designed for kids and other faster and bigger ones for teens and adults, so no-one will feel bored. The year-round warm, sunny weather that you’ll find in Tenerife makes a trip to Aqualand Costa Adeje perfect at any time of the year. Whether you are with friends or family, there are many hours of fun to be had zipping down the various slides and swimming in the pools. For added entertainment there are also daily dolphin shows. As you can see, Tenerife has so many different things to do ranging from Submarine trips beneath the ocean to helicopter flights high up in the sky, with everything else in-between. You truly are spoilt for choice. When you stay at Pearly Grey you can easily book any of these excursions by speaking to the helpful reception team, who will also be happy to answer any questions you might have about these trips. So, while you should definitely enjoy days by the Pearly Grey pool or relaxing at The Edge gazing out to the ocean, you should also try some of the many other amazing experiences that Tenerife has to offer!